It’s that wonderful time of year again! Since Borders has more or less closed their doors for the last time, why not embrace and relish our own literary greatness at this year’s Kerrytown Bookfest? The Bookfest will take place in Ann Arbor again this year on Sunday, September 11th, with events beginning at 11:00am. While the date itself has grave undertones, the Kerrytown Bookfest is a time to celebrate indie bookstores, amazing authors and the remarkable talent and perseverance of the written word in Michigan. This year proves to be something special due to the fact that much of the country has decided to sit up and take notice of the flourishing literary voices pouring forth from Michigan. Authors and poets such as Jaimy Gordon, Laura Kasischke, Bonnie Jo Campbell, Michael Federspeil, William Whitbeck, M.L. Liebler, Jeff Vande Zande, Jack Dempsey and Doug Stanton are just a sampling of those who will represent at Kerrytown this year. Regardless of your literary appetite, the Bookfest has offerings for people of all genres. The full events schedule offers children’s programs, book making workshops, illustrator samplings, indie bookstore displays, panel discussions and of course, books. Michigan acts as host and home to a rapidly growing, ever-thriving literary community. The Kerrytown Bookfest is a great way to hear from Notable authors and those whose work we admire while making connections with readers and writers who share a passion for fine literature. Kerrytown Bookfest takes place on Sunday, September 11, 2011. Travel directions, event times, speakers and more can all be found on the Kerrytown Bookfest homepage. It might be worth your while to pop over to the Wayne State University Press site if you are looking for fresh reading material. Slated for release this March are three works penned by some of Michigan’s very own. Anne-Marie Oomen’s An American Map, Laura Kasischke’s novella Eden Springs, and Michael Delp’s stories As If We Were Prey are part of WSU’s Made in Michigan Writers Series and will be available for purchase this month. Though I have only read Laura Kasischke’s title thus far, I highly recommend Eden Springs and will post my promising review later this week. Once again, I strongly suggest checking out our university presses for their rich literary offerings. 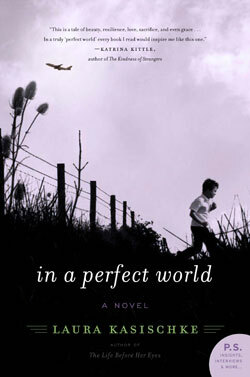 An intimate crowd gathered at Borders in Birmingham Wednesday night to hear author Laura Kasischke read from her new novel In a Perfect World. Kasischke, a creative writing teacher at the University of Michigan, was appearing for the second time since the book’s release just over one week ago. In a Perfect World is based on character Jiselle, a young flight attendant contending with a new marriage, stepchildren and a bizarre pandemic that threatens both her new family and the world at large. The Phoenix flu of the novel ironically echoes that of several recent pandemic outbreaks; the most recent being the H1N1 (swine) influenza. However, Kasischke had completed her writing of the book prior to the Swine flu wave and chalks it up to bizarre coincidence. Ms. Kasischke said this latest work took her about two years to write and had many incarnations. She relies on her husband to read her final drafts but doesn’t bother him to micromanage each chapter she writes. When it comes to making appearances, Kasischke says she appreciates the objectivity of her readers and is grateful for their suggestions. Being a mother and teacher leaves Kasischke little room for her own creative writing which she tries to get to every day. Though she squeezes writing in whenever she can, she admits she is forced to write “even if she is not inspired”. After amassing her work, she then looks for the theme and “carves out the story”. No doubt Kasischke is a fine whittler, she now has seven collections of poetry and seven novels published in her name. Kasischke will continue her Midwest tour for In a Perfect World over the next several months making several more appearances in Michigan. Check the Borders website and your local libraries for upcoming dates and times.